Learn more about the Papa's Pig Out! Bet you can’t finish it yourself! 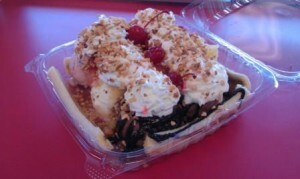 With six big scoops of ice cream nestled between 2 full bananas, the Papa’s Pig Out is quite a desert. We never thought they would actually sell, it was orignally added to the menu as a novelty item. The popularity has really taken off, some days we sell more Papa’s Pig Outs! than we do banana splits. Boasting over 1.5lbs of ice cream, this would be the perfect item for a family of 4 to split for desert. We do have some adventerous customers who try to tackle finishing one by themselves. As you can see by the youtube video below, I wouldn’t put it past any of our Cold Rush contestants to accomplish that!